This fun and engaging game supports children’s conceptual understanding of multiplication and offers another way to help your child learn their times tables facts. The first player rolls both dice. 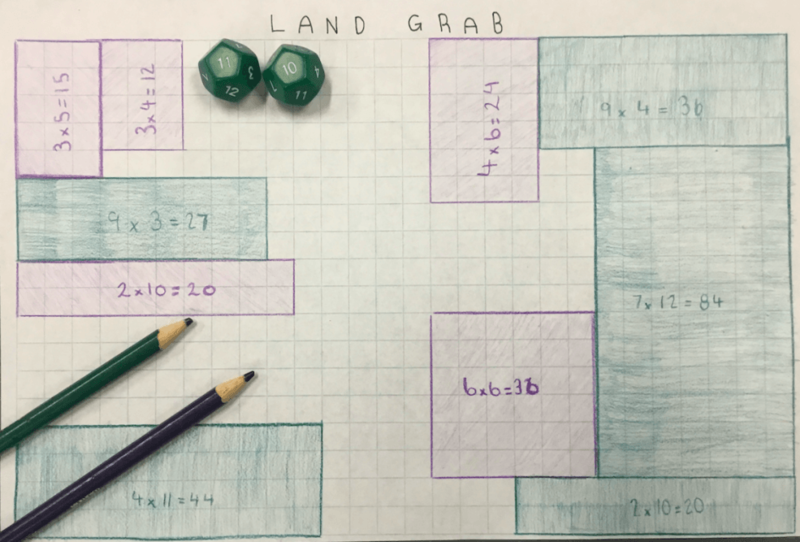 The numbers become the dimensions of the rectangle/square the player will draw to take up the most land. Players can choose which numbers will form the length and the width of the rectangle, and consider the best strategy in order to claim the most space on the playing board. The first player colours in the area with their colour. They then write the multiplication sentence in the middle of their shaded array (for example, 4 x 5 = 20). Players take turns until the graph paper is almost filled. At the end, there will be plots of land that require an exact number roll to fit into the space provided. If this is the case, players have to skip their turn if they don’t roll that particular number. Be ready to get competitive at the end! Whoever claims the most land, wins! This game can easily be modified by using different sets of dice. If you are just learning your multiplication facts, use dice with stickers on the faces, marking the numbers 0-5 only.